This recipe reminds me of a time when I was newly married and had just moved to a new city. My husband had many friends there and that resulted in us getting a lot of invitations for dinner. I remember being painfully shy (and still am) and how overwhelmed I was – new people, new names to learn and not to mention a NEW husband and a new place to call home. Despite all the anxiety associated with the new experiences, I distinctly remember the warmth I was welcomed with and the fabulous food that we were served on several occasions. We moved out of that state in a few years, but the friendship and the recipes that were so generously shared will always stay with me. 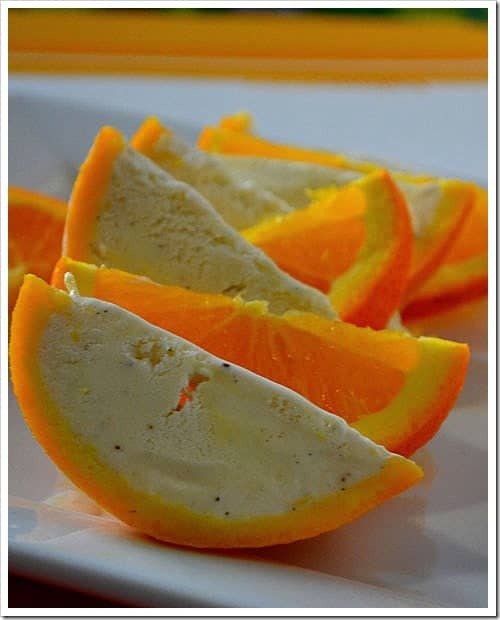 Once such recipe was for Ice-cream in Orange peel. We were served this dessert and I was blown away and more so when the hostess insisted it was a simple recipe and anyone could make it. Well, I did make it but it took me almost 9 years. Thanks, V for sharing this recipe with me and for being one of the most generous and kind-hearted people I know. 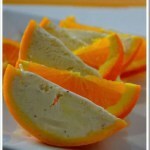 Note – You need navel oranges since they have a thicker peel compared to others like clementine. Take your favorite vanilla ice cream and set them in the counter to melt. Wash the oranges and cut them in half. 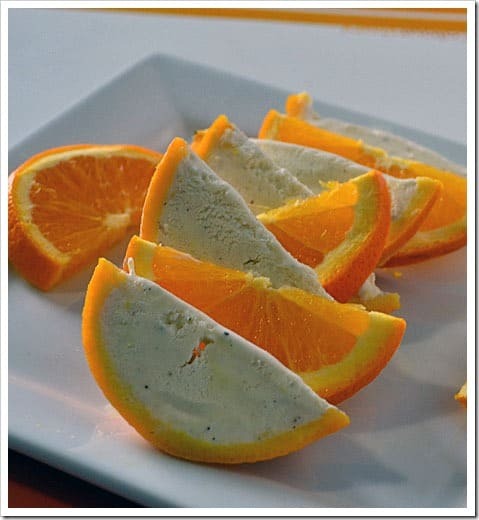 Scoop the orange sections out and set them aside for a salad or just eat them. I preferred to juice the oranges. 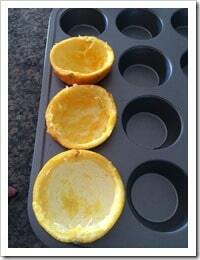 Place the orange halves in a muffin tin so that they hold shape. 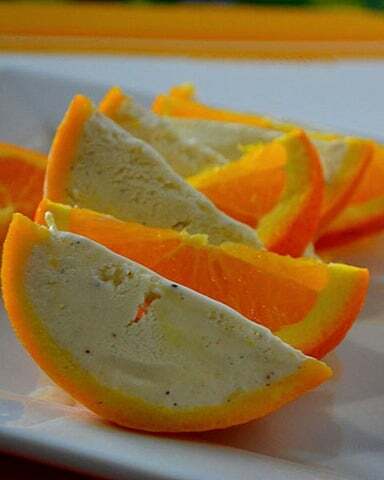 Scoop the half melted ice-cream into the orange halves until all your orange halves are filled to the brim with ice-cream. 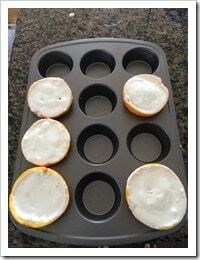 Place the muffin tin in the freezer for 6-8 hours. 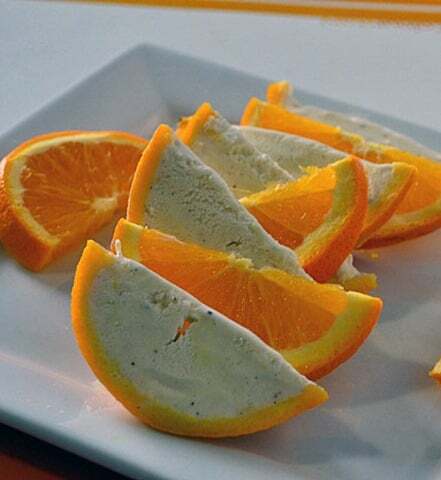 Use a very sharp knife to cut the oranges into wedges of the desired size. Voila! Your ice-cream is ready!